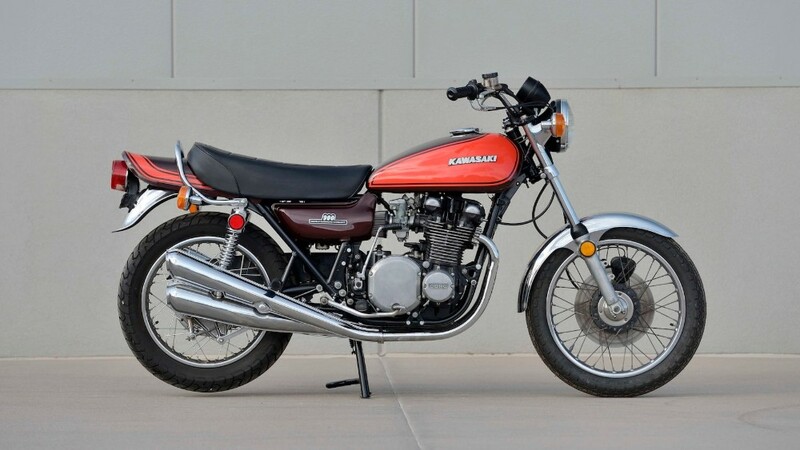 The Kawasaki Z1 was nick-named the 'King' ... which kind of says it all! Suffice it to say, it was well-received, on its release, in 1973. Bikers had been force-fed a diet of old technology for years - usually due to lackadaisical management. That was blown away by the Oriental invasion. When the Japanese disembarked at the Isle of Man, for the first time, 'Brit bikes' were already dead in the water ... they just didn't know it yet. The TT victories which followed, presaged the future ... for roadsters, as well as racers. With Kawasaki's 'Z1', that future had arrived! The Z1's twin-camshaft, four-cylinder motor left its competitors gasping for breath! The ageing 'thumpers', twins and triples simply could not compete. The Z1 roadster took cycle parts, too, to a new level. The 'King' came, saw, and conquered! It was not long before the British bike industry was no more than a memory. The Z1 heralded Kawasaki's iconic 'Z'-series. Hail the Japanese superbike! Never again would bikers settle for second-rate. From then on, a test-ride served up good performance and decent handling - or the deal was off! The Kawasaki Z1 had secured its place in motorcycling's pantheon. And as for 'Brit bikes' ... the king was dead, long live the 'King'!